(AKA Ginger Snaps 2) 2003, Starring Emily Perkins, Katharine Isabelle, Tatiana Maslany, Janet Kidder, Eric Johnson, Pascale Hutton, Patricia Idlette, David McNally, Susan Adam, Shaun Johnston, Jake Mackinnon. Directed by Brett Sullivan. Released with hardly any publicity, Ginger Snaps came and went from Canadian theatres in 2000. Like Ginger in the film, time proved to give the Snaps a life of its own, as it quickly found a new life on video. Not only well regarded in its motherland, Ginger Snaps has gone on to garner kudos on a global level, with many horror circles championing it as one of the premiere werewolf films. 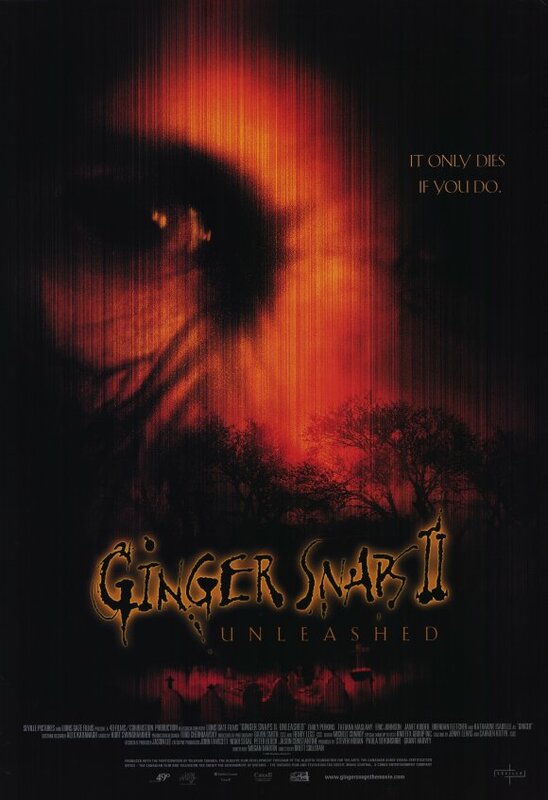 With its newfound commercial and critical success on video, it is no surprise that Lions Gate has decided to capitalize on this following with the back-to-back continuations: Ginger Snaps: Unleashed and the yet-to-be-released prequel, Ginger Snaps Back. Unleashed was released this past winter in select Canadian venues, and perhaps it is an indictment of our sorry state of homegrown distribution that a proudly Canadian film, shot in Alberta, no less, got limited play in only two of the sixteen theatres across Calgary. Needless to say, the film vanished from theatres nearly as quickly as it came, but hopefully video will again be Ginger Snap's savior. The film begins with Brigitte (Emily Perkins) naked and alone in a hotel room. After killing her sister and infecting herself with werewolf's blood in the first film, she is now a renegade trying to avoid her inevitable transformation. Shaving herself to uphold her innocence, she attempts to suppress the inescapable puberty-like changes her body is undergoing. "So you shave?" the sleazy warden notes of her crotch later in the film, "I think that's great!" To slow the transformation process, Brigitte has been injecting herself with wolfsbane extract and timing how fast the slits on her wrist heal. She has also been reading up at the local library, which features a scene just long enough to introduce the first victim. The library clerk Brigitte deals with is shown just long enough to establish that he is a creep, so when he is mauled to death by a werewolf it is alright. If it wasn't bad enough that the clerk wanted to copulate with Brigitte, the prowling werewolf also shares said desire. When Brigitte is found on the cold Edmonton streets after escaping from the werewolf, she is brought into a teen shelter, kept alive on life support. There she meets Ghost (Tatiana Maslany), who has been voluntarily staying at the clinic after her grandmother was severely burned in a fire accident. Ghost then updates Brigitte on the eighty year old history of the institution, which has no place in the film other than to establish context for the prequel. Ghost likes to read comics, and through their pulpy pages she learns of Brigitte's burgeoning werewolf status. Without her injections of wolfsbane, Brigitte transformation quickens. Hairy palms (take that as you will), elongated ears, a heightened sense of smell and reddening pupils signal her shifting nature. Luckily, Tyler (Eric Johnson) has access to bottles of her confiscated wolfsbane, but receiving them will come at a price. Tyler, like any good capitalist, has established a bartering system for all the girls in the institution: he will give them their fix as long as they perform sexual favors in the abandoned basement. He lets Brigitte off with only a look at her pubic region, and she is able to suppress her animalistic urges in return. Time is running out for Brigitte however, as the werewolf prowls the institution and her lusting grows ever more prevalent. Ghost understands her dilemma, and offers her an escape plan. Brigitte complies, and before long they hijack a car and shack up at Ghost's grandmother's house. The two girls create some booby traps, but as they scan the house Brigitte quickly realizes there is a history to Ghost as mysterious as her name implies. The werewolf attacks, but as the film reaches climax, that is the least of Brigitte's problems. Directed by the editor of the first film, Brett Sullivan, Ginger Snaps: Unleashed is a film with every bit of the editing polish of the original, but lacking the wit and allegory of the original's script. Where the first cleverly used werewolf lore to comment upon women's similar situation as they change from girl to lady, the second uses it only for a few bits of witty comedy. After Brigitte graphically explains her werewolf fears to a roundtable help group, the psychiatrist quickly jots down on her pad of paper: " Brigitte: Lesbian?" Both a biting commentary on the absurdity of psychoanalysis and the pessimistic connotations associated with lesbians, this is one of the few inspired moments the film attains. Considering the first was so ripe with parallels between puberty and werewolfism, the regression of this sequel to mostly cliche. Since many of the coming-of-age parallels were already hit with Ginger Snaps, it is admittedly tough for Unleashed to deliver much in the form of new content. That still does not explain for the shameless borrowing the film does from Unbreakable, of all things. Mr. Glass, Ghost both connote a level of transparency that the ending surely exhibits. The ending is so derivative and out of place that it completely negates all the development placed towards Brigitte's character, since the whole movie seems to pivot on the left-field revelation at the end. Instead of a film on werewolves, Unleashed becomes one about comics. That is not to say that this sequel is without its merits however. Emily Perkins, who again shines as Brigitte, conveys that tortured inner-self so truly with her ugly duckling-like sensibilities. Katharine Isabelle also makes a nice cameo reprising her Ginger role from the first film. For a film with a budget two-thirds the size of the original, the production values look just as good if anything it is appealing to look at. The gore is every bit as prevalent this time around, but the film offers a glossy restraint that few horror sequels can attest to. Perhaps the best portions of the film though, are the ones that distinctly signal the film as Canadian. A Canadian nature show with an intensity paralleling midday CBC is good for a laugh, as is the recreational activity of Ghost's grandmother. "She was a provincial curling champion--four years in a row!" Ghost asserts with a pride for Canada's second favorite sport scarcely voiced in Canadian cinema. The best purely Canadian moment is a short monologue one of the workers at the institution gives about public health care. "Due to cutbacks, facilities like ours have had to get creative..." she muses, explaining why Ghost's grandmother would be shacked up at a teen help institute. Made in Alberta, where premier Ralph Klein continues to cutback and privatize public services, Unleashed gives a witty jab to Canadian public healthcare consider it the B-movie equivalent to The Barbarian Invasions. The scrutiny of Canadian public services is again asserted when Ghost reveals that it took forty three days for the police to finally come to her grandmother's aid. In a time when most films attempt to mask their Canadian identity, it is rare that a film be so overt about the place in which it was made. Even the wintry Alberta landscapes are utilized to their fullest. 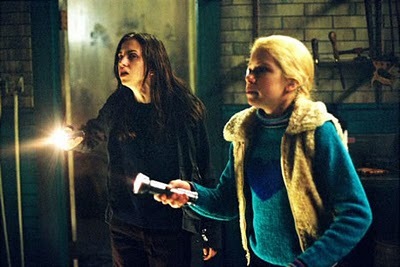 Ginger Snaps: Unleashed may be lacking the satirical bite of the original, but as a horror sequel (which are known for their inferiority) it is an acceptable follow up. However insulting the derivative ending is, the film is made with a gloss and restraint that few horror sequels ever attain. Perkins is an underrated talent, and she alone can carry the film through its cliches. For Canadians, there is also that extra bit of satisfaction of witnessing all the little idiosyncrasies of our great nation. Not nearly as inspired as the original, but still a film that ranks higher than most horror these days. Here's to the prequel!